The European Parliament’s Committee on International Trade has supported a European Commission proposal to extend the EU's autonomous trade preferences for Ukraine. An UNIAN correspondent was told this in a phone interview with Gabrielius Landsbergis, a Lithuanian MEP of the European People’s Party, after a European Parliament meeting in Strasbourg. "Everything went well, as expected, [and] we voted ‘yes,’" Landsbergis said. “The meeting was attended by about 40 MEPs, and only five of them voted against. There is broad consensus in support of Ukraine, and I would even say a broad European consensus in support of Ukraine." “Marie Le Pen (France, the National Front) called for the document to be rejected altogether, but no one responded," Landsbergis said. He said voting on the proposals will be held at the plenary session on Thursday, October 23. Predicting the results of the voting, Landsbergis said, "I am optimistic, and it is reasonable to be so. We have had representatives of all major political groups expressing their full support." The European Parliament proposal suggests "that its position be approved at first reading, based on the proposals of the European Commission". 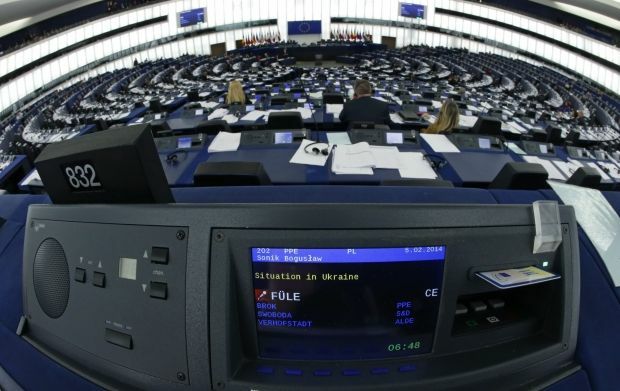 As UNIAN reported earlier, on September 16, the Ukrainian Parliament simultaneously ratified with the European Parliament the Association Agreement between Ukraine and the European Union, including the establishment of a free trade zone. However, on September 12 it was announced that the free trade area between Ukraine and the EU would take effect at the beginning of 2016, and not on November 1 of the current year as planned before, following consultations between representatives of the European Commission, Ukraine and Russia. The parties agreed to postpone implementation of the free trade area between Ukraine and the EU until December 31, 2015, as well as the extension of the EU tariff preferences for Ukrainian goods. On September 19, the European Commission introduced for the consideration of the European Council and the European Parliament a proposal to delay the provisional application of the Association Agreement with regard to the deep and comprehensive free trade area. According to the current proposals, the EP and the EU should adopt a decision under which the trade preferences will be extended until December 31, 2015. On September 29, the EU Council approved the extension of trade preferences for Ukraine until December 31, 2015.